Honed Marble Vs Polished Marble; Which one is the best? Over the years, it has been well proven that marble flooring never loses its style. This natural and timeless beauty offers grand, elegant and luxurious characteristics, which make it very popular in all sorts of residential and commercial interior design projects. However, marble is also one of the more expensive tile floorings in the market. As a result, it is wise for property owners, especially homeowners, to consider carefully which type of marble surface to use so as to achieve the best home design effect. If you are still deciding what is the right marble surface for your properties, this article aims to give you some insights into differentiating two most common marble finishes in the market – honed finish and polished finish. Honed finish usually involves chafing of silicon carbide or diamond particles to get rid of any trace of scratches and then removing a certain amount of deep-seated soil on the stone. This kind of finish leaves the marble surface with a matte, less-glossy but softer and more natural look. Polished finish, as the name suggests, involves a series of polishing by the stone polishing machine. This process transforms the marble from the rough abrasive pads to the fine diamond impregnated ones with the mirror-like shininess and fascinating radiant look. Honed Marble surface leaves a smooth, consistent and flat surface on the ground. This finish gives a velvety and smooth touch that gives a warmth ambiance and elegant touch of the natural stone. Despite the slight lack of sheer and radiance, most homeowners choose Honed Marble because it gives softer and more delicate look in their houses. Pieces of this natural stone with a bit of faded grandeur can significantly add a touch of elegance to any casual environment. In addition, Honed marbles have matte surface that is less slippery when it is wet. This kid-friendliness makes it a popular option in high traffic areas within the home. Since honed is less shiny and flat, the scratches and etch marks are less visible as well. Polished Marble finish offers a richer and more luxurious appeal. Its shiny surface is classic and sophisticated and can easily blend into any interior design project. Polished marble brings a pleasant sparkle effect. Furthermore, it comes with a huge variation of shades and colors. This versatility allows it to be used in every exquisite architectural design. 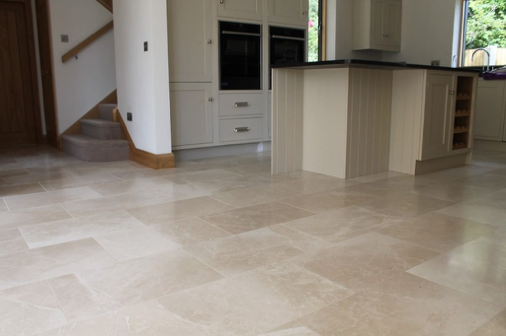 Beyond its highly refined surface, this high-end stone flooring also builds up the sense of luxury especially on open space areas, through the smooth and flawless surface. The touch of the coziness can also add comfort and approachability that most interior designers and homeowners admire. 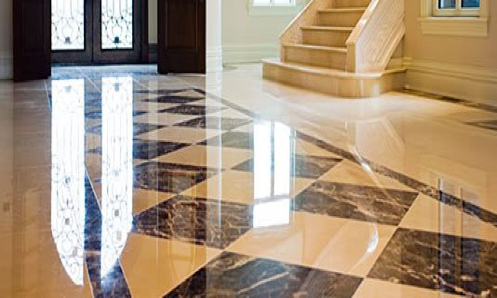 Unlike Honed finish, homeowners recommend this finish to lower traffic area of the house as polished marble is more prone to scratches and dust because of its shiny surface. Honed finish requires more re-sealing than a polished one. The polishing process closes the pores of the marble stone so polished finish has a lower rate of absorption and thus less need for sealing. Polished finish is more stain resistant than honed finished but more prone to scratches and etches. For general cleaning, it is recommended to use a non-abrasive pad and use a natural, light cleaner. Use warm water and the clean cloth to gently clean dust or debris on your marble surface. In addition, since most marble is made of the same mineral, acidic substances like vinegar, alcoholic beverages, coffee, salad dressing or harsh cleaner can damage them and should be avoided. That is all for our quick overview between honed and marble finish. 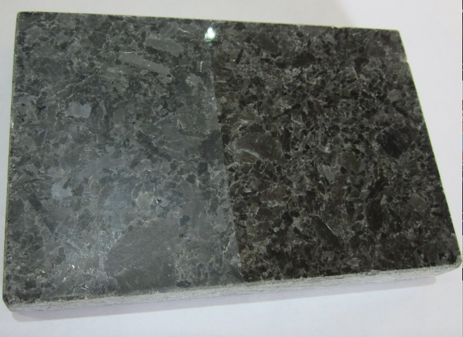 These two are the most common marble finish in the market. However, if you are interested to find out more about other types of marble finish, here is a useful resource that you may want to refer to here.